Hooray, a leak! I shut off the a/c immediately, and Dave investigated the area in the attic and found that the drip pan under the air handler was completely dry. So where’s it coming from? Condensation where there shouldn’t be any? Was something not hooked up properly? We can’t really get up there, and we’re not experts, so we need to call the guys who did the installation and have them take a look and try to fix it so it stops raining inside. Of course, it’s Memorial Day and everything is closed, so in the best possible scenario we’ll see them tomorrow, but trying to get HVAC people out during a heat wave is like… I don’t know what it’s like, because it’s too damn hot to think, but suffice it to say we probably won’t get an appointment for a week or two. I am praying we don’t need to take apart the closet again to fix this. 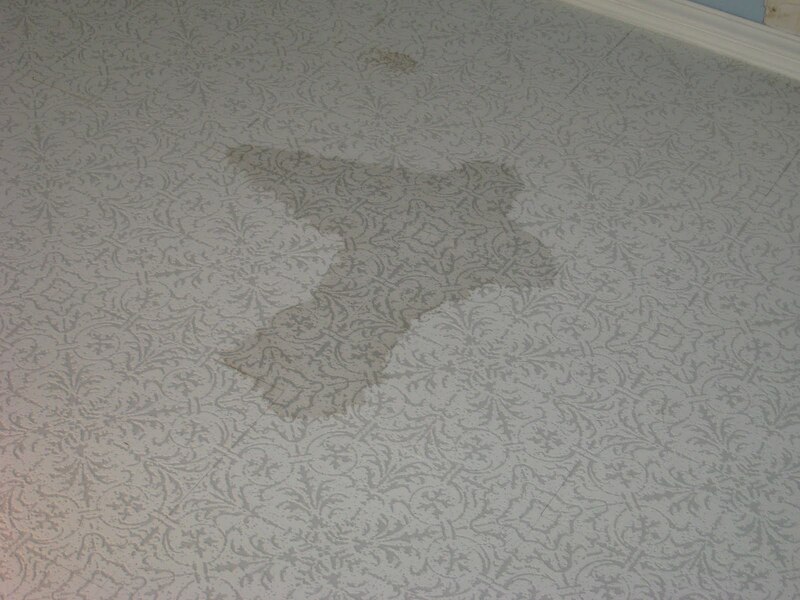 It could be worse – the leak could have gone on all day while we were at work and we could have come home to a horrible mess. It could have leaked onto our computer equipment. Honestly, an ugly patch on the ceiling isn’t the end of the world, and living in the heat for a few days won’t kill us either, so I’m trying to keep some perspective. It’s hard on us, though, because we keep having really rotten luck with this house and it’s discouraging. We love this place, which is why we bought it, but I’m almost ready to believe the place is cursed. Between the ants and the leaks and the temperature problems, I think it’s possible the house doesn’t like us and wants us to leave. Does anyone have an exorcist they’d recommend? This entry was posted in Uncategorized on May 30, 2011 by antijen. Take it as lessons on how not to sweat the small stuff.